The blackberries are ripe. It is that time of year. Unlike the clockwork regular and finely parsed schedule of humans, blackberries and indeed all of creation, have their own state-dependent agenda. Not enough rain? Well, slow down and wait. Not enough sun? Pretty much the same. But a hard, sour knot of berry after 2 days of brief showers, can transform into a glorious and fleeting taste of wine and oak and summer. That same berry after 3 days of moderate rain becomes a soggy, flavorless mush. So, if we mere humans want to taste the nectar that is a perfect berry, it is on the berry’s rather particular schedule and not ours. Usually, and in my own experience, berry picking is a group activity. There are many reasons; safety being the common concern. Copperheads, water moccasins, various spiders, toxic insects, rabid animals, are all dangers the berry picker needs to account for. So, as one picks carefully and studiously through sharp tangles for that perfect, fat berry, a barely conscious rhythm of silence and signal is maintained. Long spans of almost perfect, concentrated silence broken by a voice, a need to reconnect with others in the safety of the tribe. These vocalizations are usually minor comments on the exquisite flavor of a particularly irresistible berry, discovery of a bountiful vine, curses thrown at briars, unsteady footing or the ubiquitous and irritatingly plentiful Junebugs. For all the ire they draw in the berry patch, Junebugs are the most likely creature to be secretly envied by the berry picker. It seems that the entirety of their brief life is taken up with sitting in the warm summer sun, eating the sweetest and ripest of the blackberries and in their seemingly endless procreation. If forced, in some future attempt at karmic balance, to reincarnate on the insect level returning as a Junebug is at the top of the list. Sometimes, by chance or by choice, berry picking is done in solitude. Usually, and in this instance, early in the morning. Unlike the group pick with it’s monkey mind, monkey chatter, the lone picker is left exclusively in the company of mist, bird calls, dogs waiting patiently to be offered a bit of too ripe berry and the heavy, fruit laden vines. As I pick, I fall into a decades long body memory of practiced regularity. And in the unthinkingness of concentrated continual motion, I feel my consciousness begin to shift, ever so slightly toward opening. And in those liminal moments, I invariably begin to ponder the grinding of snail shells on rock. In certain tribes the shaman’s apprentice at his upper levels, is taught to induce a trance state by increasingly simple means. This is after he is taught the more familiar, more traditional methods: chanting, drumming, dance. The blunt instruments, if you will. After that, it is a matter of fine-tuning one’s perceptions, of understanding exactly the moment when the veil begins to part and transition into the imaginal space is possible. Without fail, each method of trance induction involves engaging as many of the senses as possible. As if focusing each part of your conscious mind and each part of your body into this one, singular activity directs your physical brain to produce the brainwave state known to us as alpha; a sort of light functioning trance state where movement and action are possible and for the shaman who is working with a patient, desirable. Of the many ways this state can be achieved, the one we are probably, and unknowingly, familiar with is sitting by a waterfall. With it’s rush of sound, smells of oxygenated air, water and mud, the feeling of moist earth beneath us and the whisper of mist on skin. We feel light and easy and relaxed. We feel good, but we can’t say exactly why. In another, it is the grinding of a snail shell on rock. The white noise of steady grinding, the rhythmic motion of the body, the smell of nacre flinting off stone, the weight of the body given to the arm and into the hand as it grinds. For me, picking berries in the morning solitude is very much like this. Full of deeply concentrated movement, careful, focused attention, the flux of insulated quiet and sharp birdsong. Those moments of near opening, of being on the threshold of that other, unreal space, allow the mind to draw connections, to have epiphanies, to make discoveries. And so, on this morning of quietly and studiously picking berries, as I have over many years and many decades, it occurred to me, unbidden, that in the innocence of my childhood, I had no realization that we were gathering the food that would help us survive in the harder months. It wasn’t as if my mother ever said to me, “We must pick these berries so we will have enough food to eat come winter.”. Although it was exactly the case on those rare occasions when blackberry dumplings and sweet tea were all of dinner. To a child, blackberry dumplings for dinner was having desert without having to suffer though collards with vinegar. Again. Unlike the nights with only fried fatback and biscuits; which were a little more obvious in their poverty. Fatback is a 2-inch thick, 4-inch wide, 5-inch long slab of pork fat with a bit of the skin left on top. Usually used for seasoning or to gather grease for frying other food. It is cut into strips of ¼ inch and fried thoroughly. The resulting strip of salty fried fat with the crunchy skin rind can be eaten, and usually was in our household, as a side to greens of any sort. Some nights, not many, but enough to create a memory, there was fatback and biscuits for dinner. It could have been the set of my mother’s mouth that told us complaining would be pointless. It was what there was. 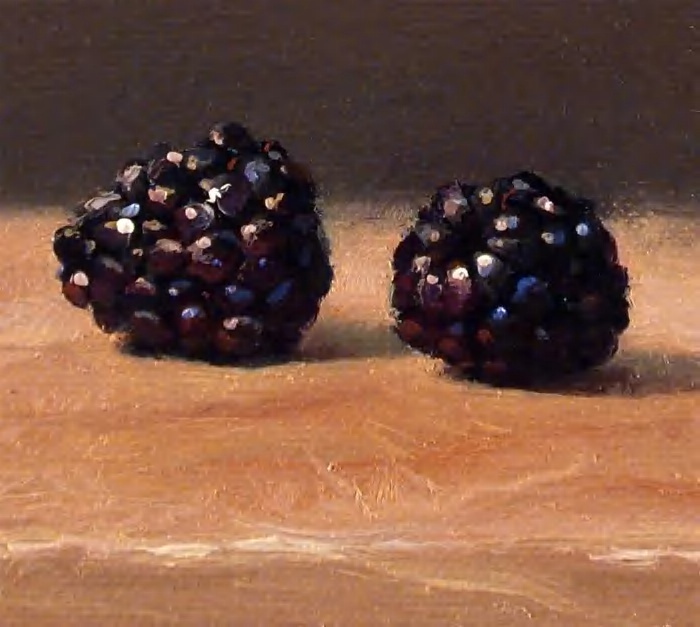 However on the nights of blackberry dumplings, it is possible that as children, we were so taken with the idea that we did not notice the intent or reason behind the novel treat came down to a lack of anything else to eat. A quart of sugar-sweetened blackberries, self-rising flour, pork fat and water. Filling and, as it stands, nutritious enough. I’m sure if, today, you could summon my mother’s spirit to ask, it would never have occurred to her that she was teaching me a survival skill by educating in the ways and means of blackberries. Nor in taking me to the garden, nor in forcing me to pick and clean and can on those days when all I really wanted in the world, was nothing more than to be in the woods packing with the dogs, catching crayfish or building dams across a shallow neck in the creek. She was simply doing what her sharecropper parents taught her to do. Garden and pick and preserve and survive. Yes, over the years I kept gardening, kept picking and cleaning and canning. But more after the fashion of Marie Antoinette, who had one of her country estates turned into a sort of royal theme park. This was constructed with guest hovels for visitors replete with various livestock housed in the shacks. Here, she and her guests played “peasant” on holiday. Like Marie’s peasantry, gardening and canning were activities that amused me; gave me pleasure. Things that I could do at my leisure. That would have no real impact on my life if it rained too much, or not enough. Or if the rains flooded and washed away all my cropland. Or, as once happened to my grandfather, hail destroyed an entire fresh planting and I had to find money, sell the cow or go into debt to buy more seed or I would not be able to pay my lease with crops and my family would not eat come the hard winter. One cannot survive on fatback and blackberry dumplings alone. It has taken me years of leisurely tinkering to learn the skills that seemed innate in my mother: how to plant just so, when best to water, who is unhappy in the plot and why, where the worm that has been gnawing on the tomato vines is most likely hiding and finding him before he strips the plant bare. And I suppose, in the end what concerns me, what has prompted these blackberry musings is a pondering on the future of food. And the future of a people that need it to survive if the rains continue to wash away our cropland or the wheat rust spreads or the price of oil makes the shipping or buying food from stores untenable. How will they learn? Who will be their teachers, their guides? We have lost so much along the way. Forgotten too much. Having grown up without want, without fear, without danger, we believe we are invincibly safe. And in thinking so, we have strayed from the safety of the tribe. Wandered off to pick in a sunny patch where gathering is much too easy and it seems for all the world that a time without plenty can never possibly come. But we have forgotten the snakes. We have forgotten the winter.